New Work #170 is part of series of works Jordan Tate created to address the idea of context, in particular the context of a museum. The photographed object, a satyr sculpted by an unknown ancient artist, is part of the collection of the Columbus Museum of Art. With little known about the sculpture or its creator, the value of this object is determined in large part by the fact that it is contained within the walls of a prestigious museum. 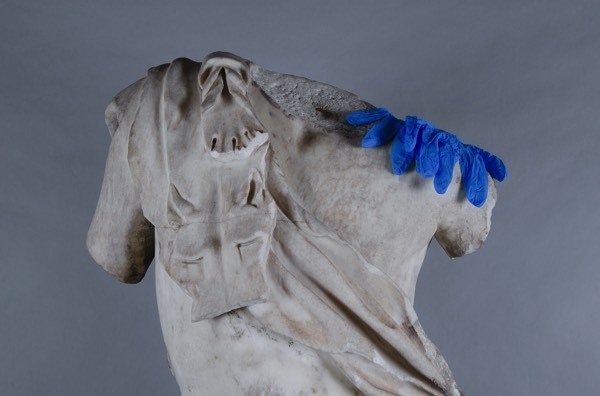 Tate chose to photograph this work casually draped with a pair of gloves typically used by art handlers, a humorous signpost for the care with which objects are handled once they enter a museum collection.